Stevie and his older cousin Jude are best friends. They hang out with each other because they don't have any other friends. Even though Jude can sometimes be unpredictable, Stevie cares about his cousin. When Jude suddenly disappears he knows something bad must have happened and he starts looking for clues in a frantic way. There's a search, but nobody is trying very hard, because of their dislike for Jude. Stevie suspects something sinister is going on. His cousin wouldn't run away. Something strange is happening in the town. People can never keep their pets, they always want to be elsewhere and end up somewhere in the forest. Is Jude there too? A little boy went missing several years ago in Stevie's town. He was later found dead and nobody could solve the mystery around his murder. However, someone knows what happened to him. Is there a connection to Jude's disappearance? There's only one person in town who's willing to answer Stevie's questions. Will Stevie eventually discover the truth and when he does, is there a chance his cousin can be saved or is it too late for Jude? The Devil Crept In is a fantastic creepy story. Stevie is a lonely boy. He doesn't get any love from the people around him and Jude is the only one he's close to. Even Jude doesn't always treat him well. Stevie is sad about his life, but he's also determined to do something about his circumstances, to stand up for himself. Stevie is struggling with some mental issues and that makes him a fabulous unreliable narrator. Not exactly knowing what was going on kept me on the edge of my seat. Ania Ahlborn tells her story in three parts and two of them are about Stevie and his cousin. The second part is about something that shocked me to the core. I was completely spellbound by the way the story progresses and even though I kept wanting to stop reading because of the frightfulness of the subject matter I couldn't put it down and had to keep going to see where it would lead. I was captivated from beginning to end and incredibly spooked. The Devil Crept in has everything a good horror story should have. There are scary shadowy creatures, there's plenty of mysterious darkness, there are inexplicable evils and there's a good enigmatic disappearance. 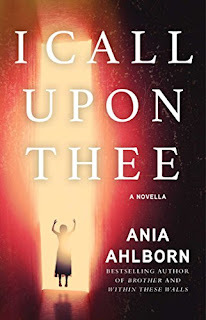 Ania Ahlborn's writing is amazing and I was definitely impressed by the way she builds her tension. I was completely blown away by this book and highly recommend it. If you love eerie horror stories you should definitely read The Devil Crept In. 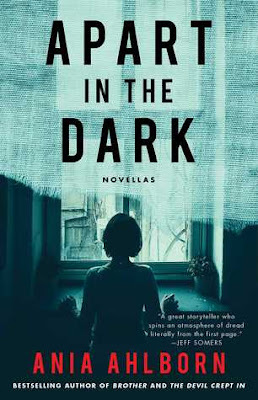 Apart in the Dark is a combination of two novellas, published in one print edition. It's 1977 and Nell works in an office in New York. Her colleagues don't like Nell very much. They're pretty girls who greatly care about their looks. Nell is plain and a little bit overweight, so she doesn't wear the right clothes. She's also sweaty and socially awkward and therefore the other girls don't include her in their social lives. Nell does her best to be part of the popular group at work, but the girls are mean to her instead. The Son of Sam, a vicious killer, is on the loose and the girls are all extra cautious, except Nell, who's convinced Sam would never choose her as his victim because she isn't one of those girls. Fortunately Nell has her brother Barrett as a house mate. They get along well and Barrett doesn't think she should be like the other girls. When Nell finally finds someone at work who's nice to her for a change she hopes she's found a friend, but things don't turn out the way she plans. This girl becomes a murder victim and the killer is suspected to be the Son of Sam's again. However, Nell has her suspicions. There's something evil going on that she hardly dares to think of. Can she stop it or will there be more victims? The Pretty Ones is a gripping story about an unpopular girl who craves attention. Nell doesn't get kindness from anyone and this makes her both sad and frustrated. Whatever she does, she doesn't seem to be able to fit in. She can always rely on her brother Barrett though. At home she's the one who earns the money and she's glad she has company. She wouldn't know what to do if she'd be completely on her own. Barrett understands Nell and the things she's going through, but he also controls her in certain ways. Nell is trying to be like the girls in her office, but Barrett doesn't approve. It's an interesting connection that kept making me curious. Barrett is Nell's life, but she doesn't seem to know what he's doing most of the time. This adds to the mystery of the story and I liked that a lot. 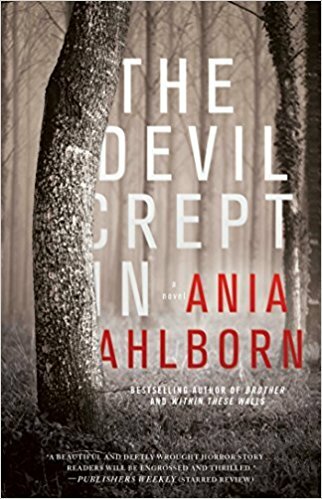 Ania Ahlborn has written a fantastic creepy story. 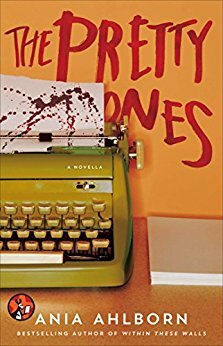 The Pretty Ones is filled with weird family secrets, plenty of blood, resentment and complex relationships. I couldn't turn the pages quickly enough and was anxious to find out more about Nell and her elusive brother. I loved how Ania Ahlborn describes Nell's work and home situation and the vivid details made it easy for me to picture everything she's going through. The story ends in a fantastic fitting frightening way, which makes it fabulously complete. If you love a good scary novella you should definitely read The Pretty Ones. Maggie hasn't seen her sisters in quite some time. She doesn't want to return home, but when her sister Brynn dies she is forced to go back to the place she wanted to get away from. Her oldest sister Arlen is living in their childhood home together with her family and Brynn never sold her part of the house and stayed with them. Tragedy is something the family has already seen a lot of and Maggie thinks she knows why. She ran away from it, but her family is still dealing with the evil that she once invited into their house. When she's somewhere else Maggie can convince herself that the darkness she feels in her childhood home is all in her head. However, as soon as she returns, she knows it's still there. Brynn's death was caused by what's in the house and Maggie doesn't know how to deal with this. Whatever is there is interested in Maggie and she can't handle this awful presence on her own. What should she do, is there someone who can help or has the evil that's been let into the house a long time ago too much power for Maggie to fight it? I Call Upon Thee is a terrifying story. I love a good ghost story and this definitely falls into that category. Brynn's fascination for a nearby graveyard brings Maggie into contact with something she doesn't understand. When Maggie buys an Ouija board she doesn't know that she has the tools to invite something she can't control. She's too young to understand and she thinks it's just a game. This is incredibly spooky and discovering more about Maggie's childhood and the consequences of bringing home that board kept me on the edge of my seat. It's the perfect basis for a ghost story and I absolutely loved it, while I was also scared to keep reading at the same time. Ania Ahlborn skillfully plays with tension. I loved the way she builds up the story. There's always a certain level of suspense and slowly it gets out of hand until it explodes, which is done in a fantastic way. I really loved the ending of the story. It's unexpected and suits the rest of the book, as I Call Upon Thee has many surprising twists and turns. I was frightened by the subject matter and could easily imagine Maggie's fascination with the graveyard and the board. It felt natural and realistic, which made the story even more sinister for me. I Call Upon Thee is a compelling story filled with darkness, shadows and occult mysteries. If you love frightening ghost stories I Call Upon Thee is an absolute must-read. Born in Ciechanow Poland, Ania has always been drawn to the darker, mysterious, and sometimes morbid sides of life. Her earliest childhood memory is of crawling through a hole in the chain link fence that separated her family home from the large wooded cemetery. She'd spend hours among the headstones, breaking up bouquets of silk flowers so that everyone had their equal share. Ania's first novel, SEED, was self-published. It clawed its way up the Amazon charts to the number one horror spot, earning her a multi-book deal and a key to the kingdom of the macabre. Less than five years later, her work has been lauded by the likes of Publishers Weekly, New York Daily News, and the New York Times. She hopes to one day be invited to dinner at Stephen King's place, where she will immediately be crushed beneath the weight of her imposter syndrome. 1: Could you tell us a bit about yourself? Sure! 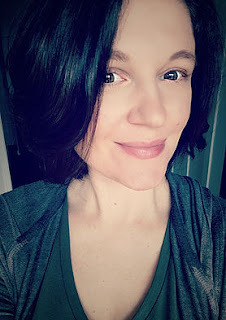 My name is Ania (pronounced Ahn-yah), I’m a Polish transplant living in the States (I’ve moved clear across the country twice in the past three years—ugh, never again! 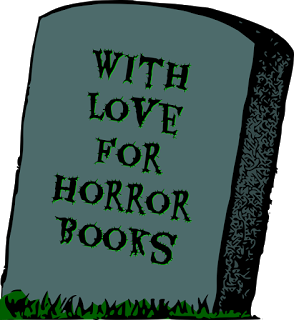 ), and I write horror and dark thrillers because I’m too chicken to follow my dream of becoming an actual ghost hunter. I mean, seriously, you guys know stuff like demonic possession and spiritual attachments are real, right? 2: What makes your heart beat faster? We dark fiction authors have a big, embarrassing secret: we’re afraid of everything. My personal nemesis is something called the palmetto bug, which is a fancy name for a fat, greasy, Southern cockroach that flies. It flies, you guys. There is nothing scarier than that. 3: Which horror monster do you fear the most? I guess I’m not so much a monster girl as I am a malevolent spirit girl. I’m drawn to the concept of demons most because you can’t see them, and how do you fight what you can’t see? Beyond that, my second choice would be people; folks like serial killers, whacked-out middle-of-nowhere-types…you know, Texas Chainsaw Massacre stuff. Because they really exist. 4: If the zombie apocalypse would happen today, what would you do? Ha! This has been a topic of contention among my friends and I for at least a decade. From what I can recall, I think we decided that hiding out in the local Walmart would be our best bet for survival. I mean, the place has food, it has camping supplies, it has guns. But honestly, if the apocalypse did happen, I wouldn’t be surprised if I didn’t last the day. 5: What's your favorite horror movie? Hands down, Stanley Kubrick’s The Shining, but I feel like that’s sort of a cop-out answer. Who doesn’t love that movie (other than Stephen King)? If we’re talking more recent films, I loved the original Conjuring. I also thought the remake of Amityville Horror (with Ryan Reynolds) was pretty fantastic. And I can never pass up a viewing of Drag Me to Hell. I mean, that isn’t scary horror; it’s ridiculous and camp. But it’s ridiculous and camp in the best way possible. 6: What's your worst nightmare? I have very mundane nightmares, like: what would I do if someone left the yard gate open and my dog took off, running straight for the busy road a quarter mile away? Or, what if, during a particularly high wind, one of the many enormous trees around my house decides its had enough and crashes into my bedroom, crushing me flat? As I said, we horror authors are afraid of everything. I’m often afraid of the toilet backing up. Or our gas fireplace poisoning me dead. 7: What inspired you to write horror stories? I was always a weird kid, and growing up in the 80’s, I saw my fair share of horror movies before I should have. That stuff just spawned my love for creepy stuff all-the-more. That, paired with my dark sense of humor…it was a natural progression. I always tell folks that I didn’t choose horror, horror chose me. 8: What do you like the most about the horror genre? I love that horror taps into our deepest, rawest emotions and leaves us vulnerable. I think, when we strip all the nonsense of daily life away, we’re all just rabbits shivering in an empty room. We’re not in control of anything. We’re all doing a slow march toward the inevitable. Horror lets us examine those emotions in a safe space, and the more we understand what we’re afraid of, the more enlightened we become. 9: What can we expect from you in the future? One very lucky reader of With Love for Books will receive a paperback copy of The Devil Crept In. These books sound like fantastic, creepy stories. I really enjoyed The Devil Crept In!! I definitely need to get a copy for my shelves eventually! And I need to check out more of her work! I've loved horror stories since I was a young girl. These sounds great to me! "The Devil Crept In" does sound intriguingly creepy! This sounds like a really frightening story, love this type of book. Ania, have you watched the original 'The Descent'? I'm not easily spooked but that one frightens the bejesus out of me every time I watch it. Why do we re-watch/re-read terrifying things? Sound pretty tense. More ppl should be doing novellas, too. These all sound like good, scary and creepy novels and novellas. Good luck with your future books. I love a good horror! It sounds awesome! Good horror! I love it! Mysterious and dark, love it. Ohhh your books sound wonderfully dark and creepy - just the way I like them! P.S. : Your worst nightmare (well, one of them) came true for me in a hotel room one day ... as if the clogged and overflowing toilet wasn't scary enough, the maintainance guy looked like he came straight out of a Stephen King novel (turns out he was just a big guy who hadn't had his mornign coffee yet, haha). It sounds very interesting. I'd love to read it. These sound creepy & really good. This sounds creepy, perfect for me! this sound perfect my kind of read! !